Highly durable, protective and decorative textured coating. 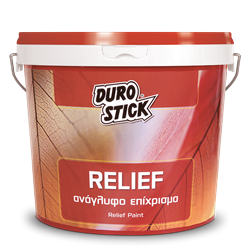 Suitable for interior and exterior use due to its waterproofing properties. Covers imperfections on plaster and precast concrete walls. For better sealing and increased adhesion, prepare surfaces using SOLVENT BASED PRIMER to increase watertightness and bonding with the substrate. Apply it using a special purpose styling foam and/or rubber roller, creating highly textured effects. Available in white that can be colored in 120 colors using DUROCOLOR, the Measuring System for Shade Rendering in 20ml syringe packaging. 1kg/m2 per coat, on properly prepared surfaces.